Dr. Smit holds an MA (Philosophy, Stellenbosch), DTh (Stellenbosch), DPhil (h.c.) (Umeå, Sweden), and PhD (h.c.) (Protestant Theological University, Groningen). 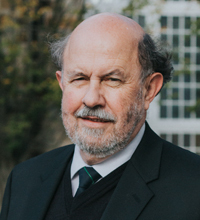 His appointments include Honorary Professor of the Humboldt University, Berlin (Germany), Extraordinary Professor of Stellenbosch University (South Africa), Fellow of the Institute for Advanced Study, Berlin (Wissenschaftskolleg zu Berlin), and Member of the Academy of Science of South Africa (ASSAf). Smit comes to Princeton Seminary from Stellenbosch University in South Africa, where he served as Professor of Systematic Theology. Before his appointment to Stellenbosch, Smit served on the faculty at the University of the Western Cape. He has also served as a pastor. Over the past three decades, Smit has emerged as one of South Africa’s most significant theologians. He has written extensively, in both English and Afrikaans, on the legacy of the Reformed tradition and its relevance to contemporary theological, social, and political questions. He has been a particularly prominent and influential voice in the church’s repudiation of apartheid. Smit was one of the primary authors of the Belhar Confession. Written in 1982 and adopted by the Dutch Reformed Mission Church in 1986, the Belhar Confession boldly declared the sinfulness of apartheid and was a call for justice, reconciliation and unity among all people. It has recently been adopted as part of the PC(USA) Book of Confessions. His teaching, supervision, research and popular writing all draw on experience in ecumenical theology and the church’s public witness in South Africa.